The change which requires proposals for new hill tracks for agriculture and forestry to be 'notified' to the relevant planning authority for approval before work can begin has now become law. This change falls short of what NEMT and other members of LINK have argued for, which was for tracks to require full planning consent, but it is a step in the direction of better scrutiny and control. The Scottish Government is consulting on draft guidance regarding the change and LINK is commenting this. As a member of the LINK Hill Tracks Group, NEMT has raised concerns that the Government's draft guidance is inadequate as it stands. In particularly, it fails to address fully the issue of the purposes of a proposed track which is a critical matter which planning authorities have to consider when deciding whether a track is permitted development or not. LINK may well produce its own guidance for planning authorities. The Cairngorms National Park Authority rejected an application from the Drumochter Estate to retain a section of track on the east side of the A9 and parallel to it. The Estate then submitted a second application. This differed from the first in that the section of track in an Special Area of Conservation south of North Drumochter Lodge was removed, leaving a request that a three mile section north of the Lodge be retained. The application was based primarily on a well-argued case that there is a significant road safety issue regarding sporting and farming vehicles turning on and off the A9. NEMT decided that the road safety issue made this application different to those whose only justification for retention of the tracks has been the convenience of the estates concerned. For this reason NEMT decided not to object but requested that a representative be allowed to address the Parkâ€™s planning committee. This should be considered a unique case because of the road safety issue and that it was critical that a decision to approve was not seen as a green light by other landowners in the Park to apply for retention of tracks. There is a case to postpose a decision until it is clear whether Transport Scotland's plans regarding dualling the A9 at Drumochter will address the road safety issues. The Park officials recommended that a condition be included to plant a belt of native trees on the east side of the existing coniferous belt to lessen the visual impact. NEMT argued that a further condition be added that the existing and new trees should be permanently retained and never felled. Because of experience elsewhere that conditions related to hill tracks are sometimes ignored by estates and not enforced by planning authorities, NEMT requested that the Park work closely with the estate to ensure that the remedial work and the tree planting is carried out timeously. The Planning Committee decided to approve the retention of the track but strengthened the condition regarding the tree belt to include its maintenance. Interestingly, there was considerable discussion at the Committee regarding potential parking and access problems for skiers and hill walkers related to the dualling of the A9. Watch this space! In the last edition of Mountain Views, it was noted that the new tracks built to facilitate the Beauly Denny line over the Corrieyairack would soon present a challenge. We weren't wrong! On the north side, the track runs right up to the bealach where offshoots lead to individual pylons. Information received by NEMT informally suggests that an application to retain the lower section of this track may soon be forthcoming. We suspect that this may be connected for proposals for a wind farm (see wind farm update). 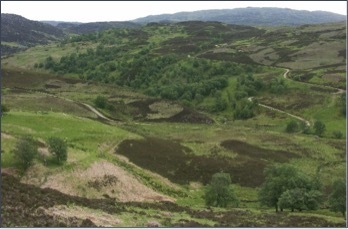 On the south side of the Corrieyairack, the lower section of the track has been approved for retention but the upper section, which does not go as far as the bealach will, according to SSE, be removed this year or early in 2016. However, the big issue on the south side is the proposal by SSE to build a large substation for the proposed Stronelairig wind farm (see wind farm update).